Saturday shall now be called Marshmallowgate. I try to be a caring friend and think there should be marshmallows for everyone in the world. 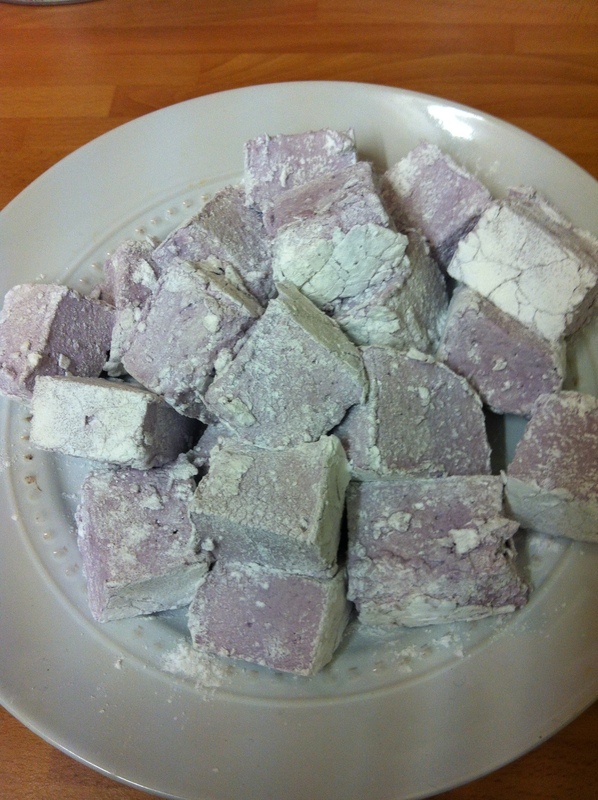 So when I started out to make some fluffy, lighter than a cloud marshmallows, I bought especially veggie gelatine so my friend could gorge herself which the rest of us, being a vegetarian. While making up a syrup, getting my beautiful Kitchenaid ready, I softened the veggie gelatine in preparation, trickled the syrup slowly over the gelatine so the gelatine wouldn’t be scolded and not fast that it would hit the whisk attachment and throw hot sugar everywhere, I was loving and gentle with the mix, not rushing it or being impatient. 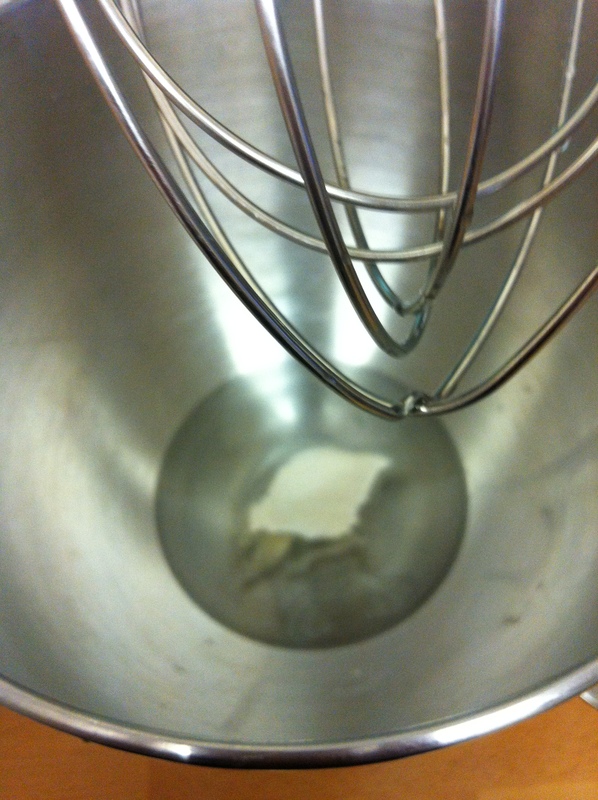 And what was I rewarded with after 15 minutes of high-speed whisking???? Attempt two. This time no Miss Nice Friend. I went all animal! I used leaf gelatine instead of powdered as I always get the best results for my jellies using it. The following recipe is adapted from Joy The Baker‘s Giant Mint Choc Chip Marshmallows. I was surprised that the recipe didn’t have any egg whites but the results were great! I kind of went off piste with the flavouring and colouring, to be honest. Now I know that in Joy’s she did use mint extract and I used peppermint, but then she used green colouring the appropriate colour for minty things – I went violet. It’s a bit weird. At uni, I and my housemates went through a phase of colouring our homemade sponges and icings with the brightest colours you can imagine. Normally looking like the food props from the film Hook when the Lost Boys have a food fight. I haven’t lost that phase. I’m looking forward to making them again all different flavours. Also, I know it’s in Joy’s title but I didn’t think that it would make as much as it did. So if you’re in the Bristol area and fancy some fluffy peppermint marshmallows that might be coloured weird – get in touch, it’s coming out of my ears! 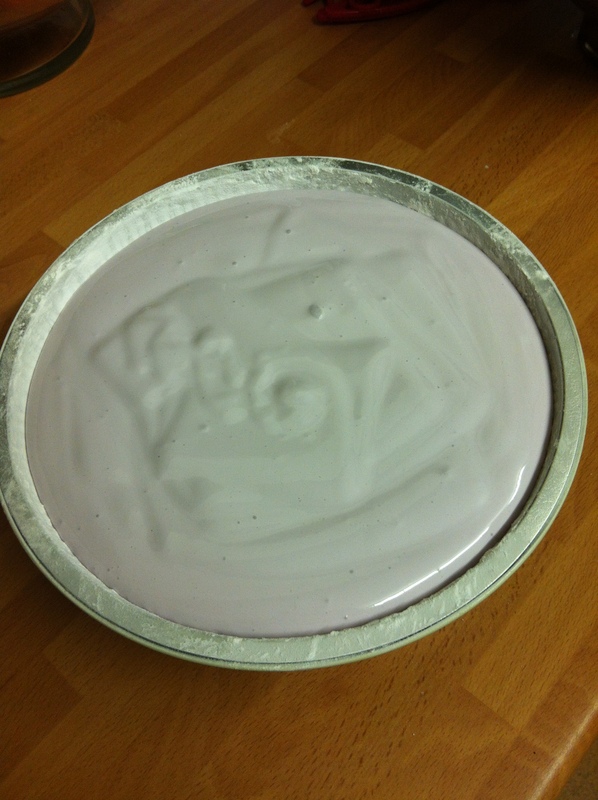 Grease an 8×8″ cake tin, I used disposable foil dishes to save on washing up- I’m lazy like that! Shake the icing sugar inside so that you have a light coating of powdered sugar and set aside. 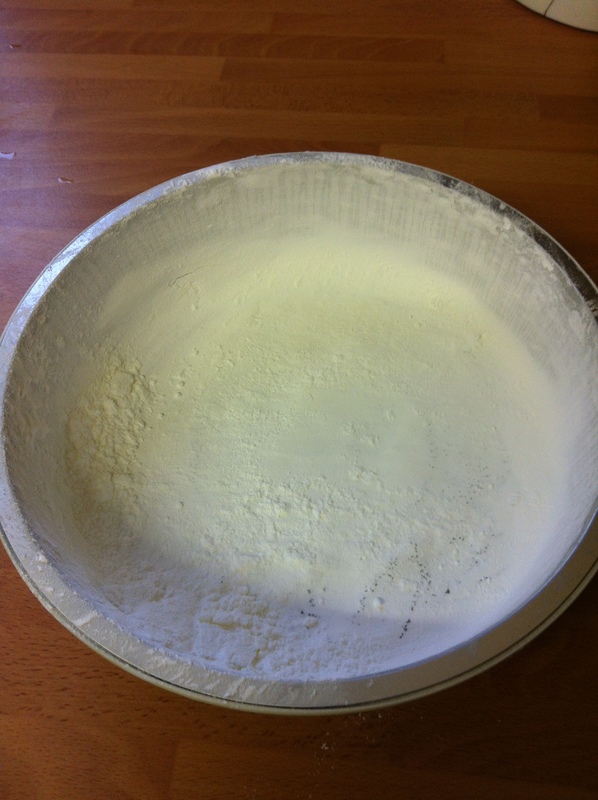 Put the extra icing sugar in a bowl, you will need it again at the end to coat the top. 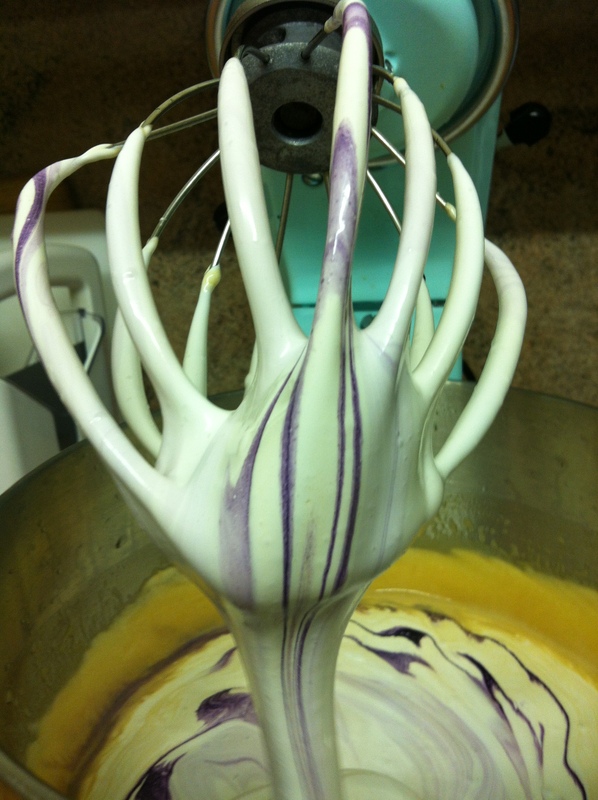 In the bowl of a stand mixer fit with the whisk attachment, place the gelatine and half the water into the bowl and add a small amount of food colouring. In a medium sauce pan over medium heat, combine the granulated sugar, golden syrup, salt and the remaining half cup of water. 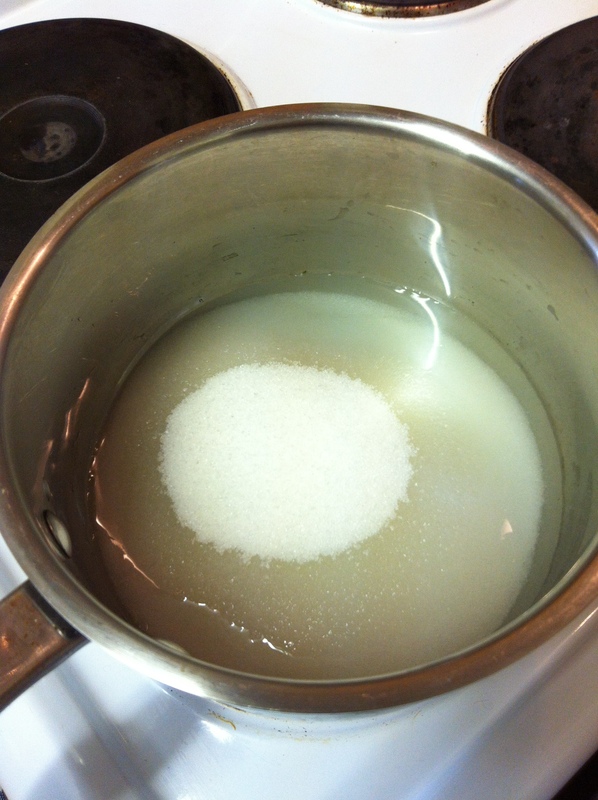 Stir gently until the sugar is dissolved, and then with a thermometer, boil the sugar mixture until it is 115C. BE CAREFUL! You are going to be handling hot sugar, don’t be dancing all around the kitchen with it. Pour the sugar mixture into the gelatin mixture in a steady stream whilst whisking on a low speed, this was the bit I was concerned about but its fine. Once all of the hot sugar has been added, you are going to slowly increase the speed on your mixer to high and then blast it for about 12 minutes. 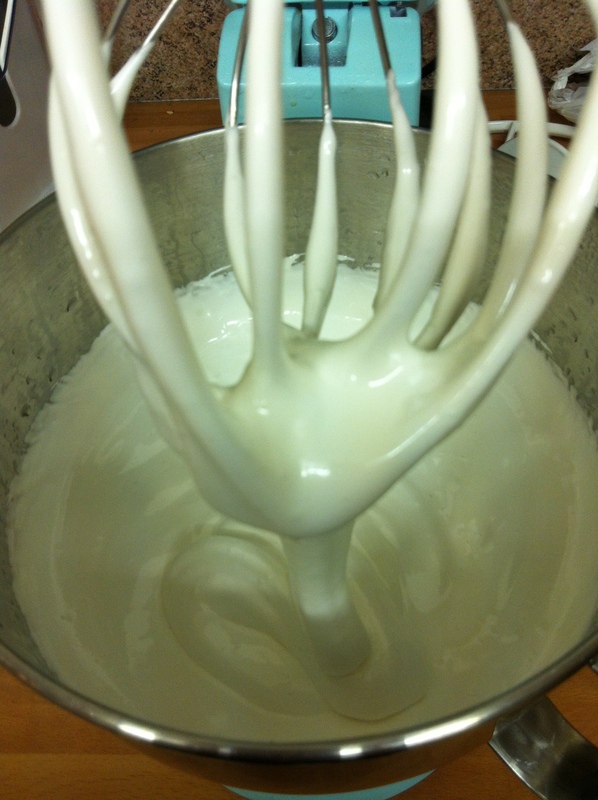 The marshmallow will start to be thick and glossy. You’ll see the gelatine tapping the air bubbles and becoming lighter and fluffier. 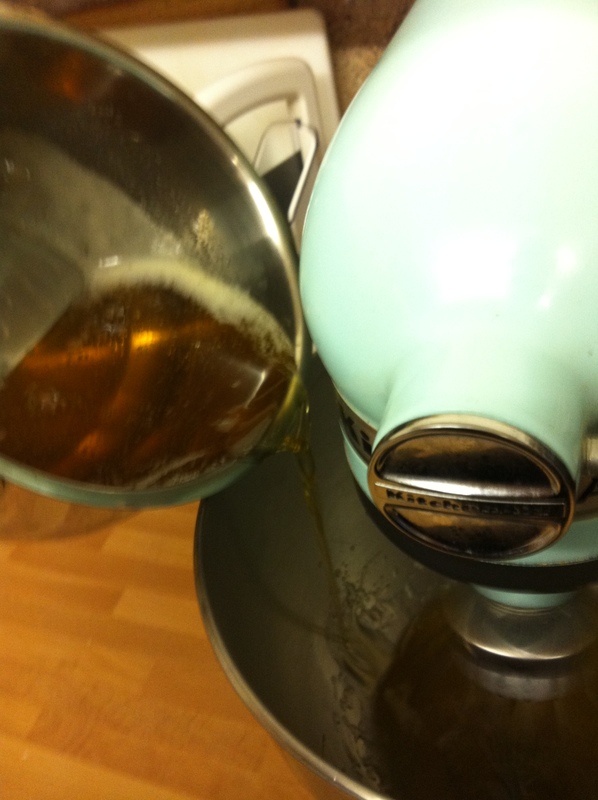 Add the mint extract and beat on high for about 3 more minutes. Spread the mixture into the pan, and smooth with an offset spatula. If it is sticking too much, wet the spatula. Sprinkle the top with powdered sugar and let sit for at least 4 hours or over night. 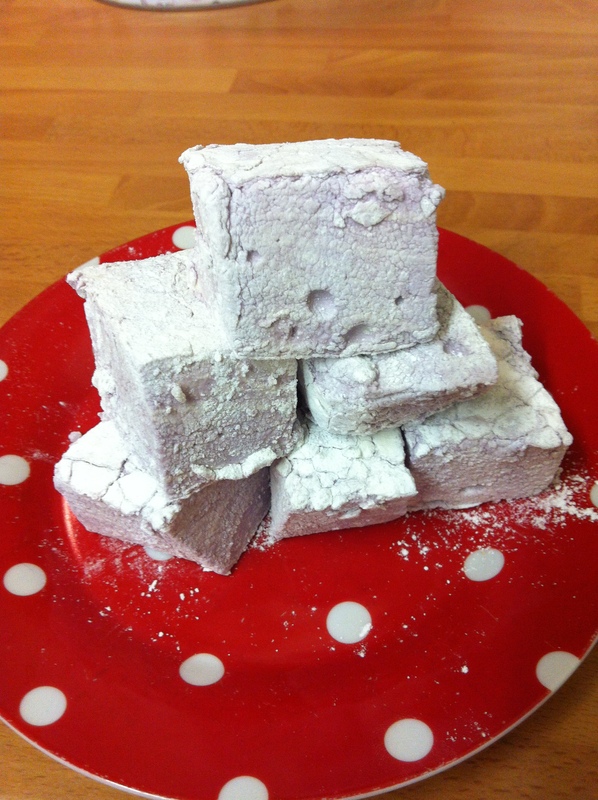 Turn the marshmallow out on to an icing sugar coated board and slice it into nice big chunks. I dusted my knife with icing sugar to stop it sticking. Toss them in a little more icing sugar to keep them from sticking together. Joy says they will last for 2 weeks in an air tight container but, to be honest, they won’t last that long!! !